Looks good, love the colors, but very thin. Add elegance to to any bedroom with this 3-Piece Reversible Quilt Set by RT Designers Collection. 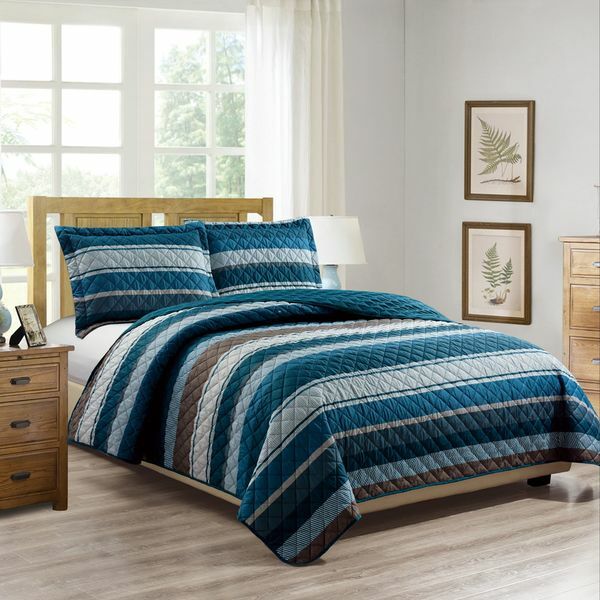 This 3-Piece Reversible Quilt set features a reversible design that showcases a stripe patterned top and solid reverse. Crafted from high quality microfiber is soft to the touch and easy to care for for years of vibrant color. Though minimalist in style this quilt set is rooted in rich sophistication. "The description says the colors are blue, grey, and white. In the photos, it looks like it is emerald green, a little brown, and ivory. What are the actual colors in the quilt? Thank you." This quilt is navy/teal, brown and off-white. There is no emerald green in this quilt.